OBANGAME EXPRESS 2015: Two steps forward. One step back. Between 19 and 27 March OBANGAME EXPRESS, African Partnership Station’s annual exercise since 2011 took place off the coasts of West African states between Côte d’Ivoire and Angola. It is the fifth iteration of this exercise that has grown from nine participating nations in 2011 to 23 this year, including 12 Gulf of Guinea countries. Crucially, the framework for OBANGAME EXPRESS has changed since the last exercise. On 25 June 2013, 22 West and Central African countries signed the Yaoundé Code of Conduct, a document that obliges the member states to co-operate on preventing and prosecuting all forms of maritime crime and illicit activities at sea and to share information between each other. OBANGAME EXPRESS 2015 was the first exercise in this series to rehearse and test the new structure and, where they existed, procedures. Broadly speaking, the Yaoundé Code of Conduct (YCoC) provides for a hierarchical information sharing and co-ordination structure that includes all countries from the two regional economic communities – the Economic Community of West African States (ECOWAS) and the Economic Community of Central African States (ECCAS). 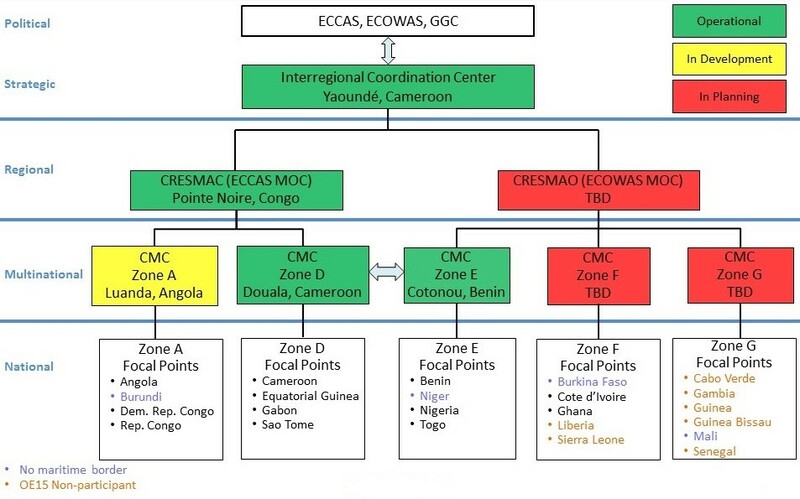 The YCoC structure envisages an Inter-regional Co-ordination Centre (ICC) for the strategic level, regional reporting centres for both ECOWAS and ECCAS and below those, for operational co-ordination, Multinational Co-ordination Centres (CMC), grouping the Gulf of Guinea countries into five zones: A, D, E, F and G.
One of the key differences of this year’s OBANGAME EXPRESS was that it took place off all the Gulf of Guinea states’ coasts rather than in a single exercise area. This made for a realistic setting regarding the command and control as well as logistical challenges for the region’s navies. It also allowed the YCoC structures to be tested with realistic timeframes, as target vessels transited through the Gulf of Guinea nations’ waters. It also added another layer of complexity to the already very demanding schedule of OBANGAME EXPRESS 2014. Was it too much, given some of the modest outcomes of last year’s exercise? Was it an exercise in window dressing? 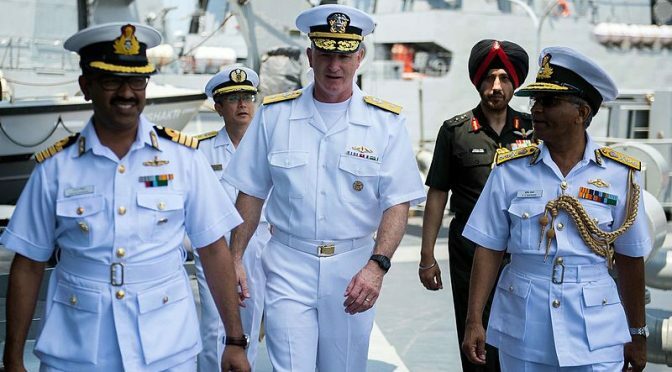 Or is the Gulf of Guinea on a good path towards becoming part of the “global network of navies” as the exercise’s officer in tactical command, Commodore John Rinko (USN), predicted during the opening ceremony in Accra, Ghana? The truth, as always in this region, is probably somewhere in between. The core functionality that this exercise tested was that of the 21 Maritime Operations Centres (MOCs) on national, sub-regional and regional levels and their ability to communicate, co-ordinate and direct maritime interdiction operations (MIO) represented on a tactical level by patrol boats, boarding teams and special forces teams. It became clear during the exercise that the information flow functioned broadly as envisaged by the YCoC despite a lack of reporting standards and procedures, absence of a common interpretation of the situation picture, organisational and technical deficiencies (which affected some MOCs more than others). There is also still an overreliance of many MOCs on tracking vessels via their Automated Identification System (AIS) signals. Given that the majority of criminally active vessels in the Gulf do not broadcast this signal, in addition to an increasing number of merchant vessel switching off their AIS as a self-protection measure as per industry guidance, it effectively reduces any Maritime Domain Awareness (MDA) capability to near zero outside coastal radar range. This is a particular challenge also for tracking and combating illegal, unregulated and unreported (IUU) fishing activities, since many fishing vessels do not have AIS transponders or choose to switch them off while poaching. Additionally very few Gulf of Guinea nations, such as Ghana, have integrated their coastal radar stations into their MDA systems. Farther south, in the Republic and Democratic Republic of Congo and in Angola there is no meaningful coastal radar coverage at all at the moment. On a positive note: the Nigerian Navy, as the first Sub-Saharan navy ever, transmitted a radar picture via data link from a vessel to the MOC. Given the recent acquisition of three more large Offshore Patrol Vessels (OPV), this at least opens the prospect for a better surveillance of the Nigerian Exclusive Economic Zone (EEZ). Beyond the artificiality of the exercise, however, old suspicions and prejudices are hard to eradicate. 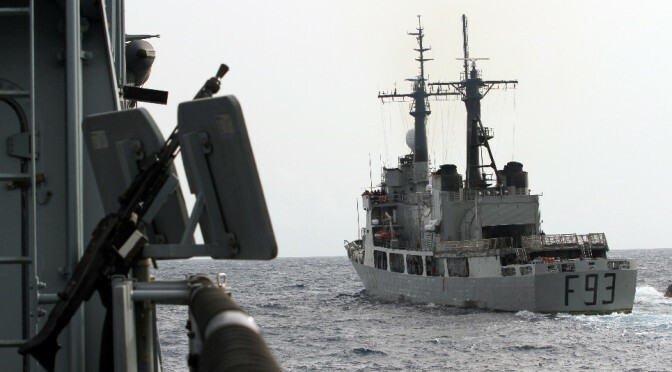 While Nigeria and Cameroon played their part well in exercising tracking and intercepting suspect vessels at the border between Zone E and Zone D, Cameroon does not grant Nigeria the right of hot pursuit into her territorial waters in real life. Equally, the Ghanaian chief of naval staff, Admiral Biekro, casually announced the formation of an “information-sharing coalition” comprising Côte d’Ivoire, Ghana, Togo and Benin, conspicuously leaving out the elephant in the room. Circumspection in sharing information with Nigeria is widespread in the northern part of the Gulf of Guinea and, based on the performance of Nigerian criminal networks and their current relationship with the Nigerian political and military elites, certainly justified. Nevertheless the Nigerian Navy was determined to contribute as best as it could in the face of political constraints. The detachment of one of the Nigerian Air Force’s precious ATR-42 Maritime Patrol Aircraft (MPA), which are used as reconnaissance planes in the campaign against Boko Haram in Nigeria’s northeast, was a signal that, whatever the shortcomings, Nigeria was willing to engage. Only a few days later, the same MPA flew out to south of Sao Tomé to assist in the real-world episode of the scuttled IUU fishing vessel THUNDER. This mission, too, reflects the spirit of the YCoC; Sao Tomé lacks air assets for Search and Rescue (SAR) – for the purpose of the exercise this had been simulated just a few days earlier by a Portuguese Air Force P-3 Orion flying out of Sao Tomé. On the tactical level, results were also mixed, ranging from pleasant surprises to disappointments. All navies struggled with the absence of formalised and trained procedures for Maritime Interdiction Operations (MIO). The teams deployed by the African nations typically lacked consistent tactical skills for boat handling, boarding and close-quarter including room-clearing as well as command procedures. Poor communications equipment aggravated those shortcomings; usually only the team leader had a VHF radio to communicate with the mother ship. The dismal performance of the Nigerian SBS team was particularly disappointing after last year’s credible performance. 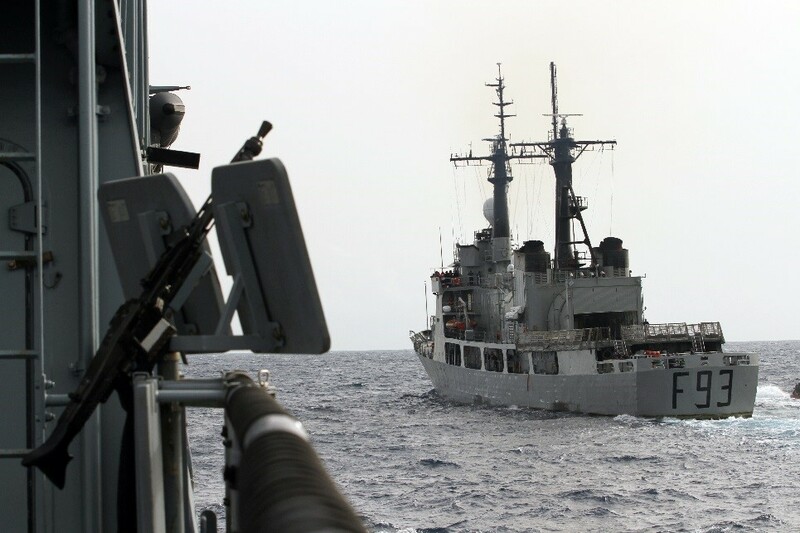 However, this year’s team which boarded the German frigate BRANDENBURG in an opposed boarding scenario was actually a land-trained team that had seen combat in Nigeria’s northeast. The tactical deficiencies that this team displayed are a lesson for those (especially in the private sector) who believe that combat experience alone is sufficient qualification for succeeding in maritime security missions. Togo’s embryonic MIO capability on the other hand made visible progress since last year. While tactics where still not near anywhere that would enable the Togo Navy to carry out anything else than compliant boardings, the team appeared more professional and self-assured than last year. Once on board, the team, which included specialists from other agencies, made a good job of securing the crime scene and preserving and collecting evidence. Ghana’s MIO teams for the exercise received a three-day pre-sail training by the German Navy’s naval infantry. 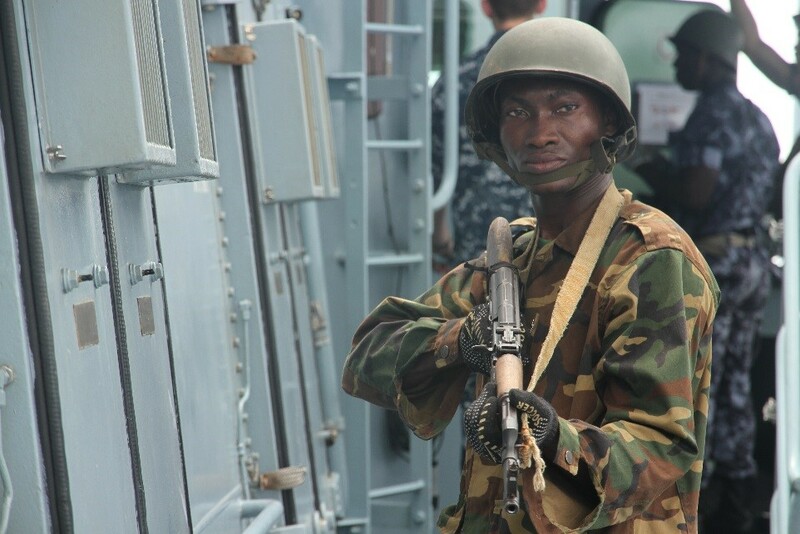 It was also a useful lesson for the Ghana Navy that the exercise should really test real arrangements rather than such made specifically for the exercise. In this case Ghana had hand-picked four MIO-teams from different vessels for OBANGAME EXPRESS. Lack of familiarity of the boarding officers with their teams as well as the inclusion of non-naval specialists from the Police, Fisheries etc. made for very mixed results. The risks of the lack of formalised procedures were apparent during the real world incidents of the MT MARIAM and FV LU RONG YUAN YU 917. 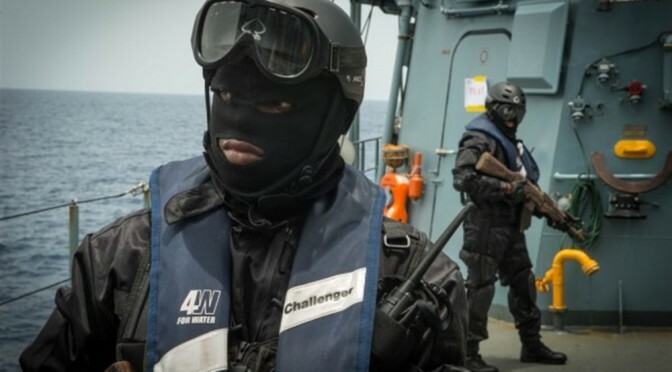 Both vessels were hijacked by Nigerian criminals in January and February 2015 respectively and subsequently recovered by Ghana Navy boarding teams from the patrol boats BLIKA and CHEMLE, both of which took part in the exercise. In the case of the MT MARIAM luck and good improvisation played a great part in the success of the mission. 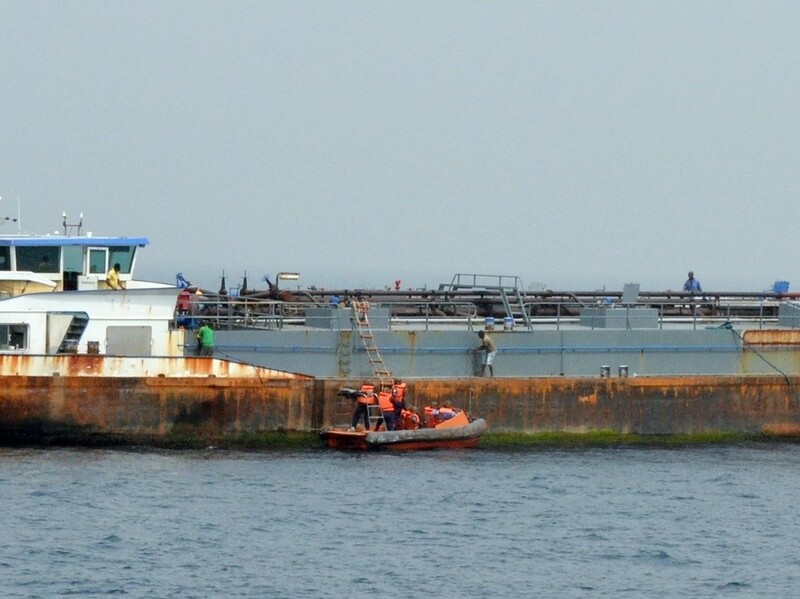 The Ghana Navy boarded the tanker 26 nm outside the port of Tema (the BLIKA having unwittingly passed the tanker INVICTUS, which had siphoned off the MARIAM’s cargo, on the way) with a boarding team comprising a mere seven persons (in addition to the two-man crew of BLIKA’s sea boat). The fact that five of the eight suspected pirates on the MARIAM were hidden away in a water tank without guns only emerged after a while and after the initial team (of five persons) had almost given up the search. The remaining three suspects were holed up in the chain locker. One of the apprehended suspects from the water tank was used as a mixture of human shield and go-between when the Ghana Navy team had to approach the only entrance to the compartment through a narrow corridor. Fortunately, the three remaining suspects gave up and then, bizarrely, tried to hide themselves in the small compartment. In the end it was perhaps fortunate that, whether abetted by the MARIAM’s crew or not, the Nigerian criminals chose to place themselves into a position where the small Ghana Navy team could deal with it effectively. However, the vignette also holds a strong message that in the case of a non-compliant or opposed boarding this vessel recovery would not have gone ahead or if it had, could have ended in disaster due to the inadequacy of the boarding team. The Ghana Navy’s Flag Officer Fleet, Commodore Mark Yawson, and the Director of Operations, Commander Derrick Attachie saw this exercise as an opportunity to improve and to identify what should be the navy’s priorities in training and procurement. Clearly, this is what an exercise is designed to do, but in some cases there remains some doubt that even though there is a will to address deficiencies identified in the exercise capabilities may not be available. Low operational readiness of some navies, absence of reliable fuel supplies (even for the exercise), systematic communications infrastructure shortfalls (poor internet, a “gap” between VHF and HF coverage at sea) are not problems easily addressed without a significant increase in funding, which is unlikely to be forthcoming in the short-term. Some improvements, while noteworthy and laudable, are improvements from an extremely low level, such as those made by Côte d’Ivoire, Republic of Congo, Democratic Republic of Congo or Sao Tomé and Principe. In the latter case, in spite of great personal engagement by junior officers and NCOs, there appears to be very little top-level support. The evaluator for the Sao Tomé MOC pointed out that the centre did have a higher level of performance some years ago, but that it seemed the operation had been started from scratch again. The true “success” of OBANGAME EXPRESS over the years is really in highlighting all these aspects and tracking progress – or absence thereof. The annual exercise also provides a benchmark and while the political message will always be one of continuous improvement, the analytic tools are actually fine-grained enough to register the nuances of change in either direction. As in 2014 the closer look at the individual results and how they came about raises the question of “sustainability” of the progress achieved so far. It is evident from this year’s results that gains made in the past can be lost in no time for as long as the effort does not become systemic. There is a strong desire by the US to get other nations more involved in the maritime security effort. With the EU’s new Gulf of Guinea action plan the time may be auspicious to broaden the base of this capability-building effort with more permanent and long-term commitments by extra-regional powers (where this is desired), but with a view to “responsibility sharing”, rather than an open-ended engagement. This effort will be complex, given different priorities: Europeans and Americans are worried about drug trafficking while most West African governments are more concerned with the smuggling of cigarettes and oil products. Piracy is another priority for the EU and the US while it is less important for many African politicians who have to fight against pirate fishing to be able to feed their growing populations. The road ahead is still long. And as this year’s exercise showed: it also is not straight. Dirk Steffen is a Commander (senior grade) in the German Naval Reserve with 12 years of active service between 1988 and 2000. He took part in Exercise OBANGAME EXPRESS 2015 as an observer during the German Navy’s MIO-team training in Ghana before transferring to the Exercise Control Group as a Liaison Naval Officer. He is normally Director Maritime Security at Risk Intelligence when not on loan to the German Navy. He has been covering the Gulf of Guinea as a consultant and analyst since 2004. The opinions expressed here are his alone, and do not represent those of any German military or governmental institutions. For many, the game Mastermind is their first adolescent introduction to cryptology. A code-breaker is given limited turns to discover the encrypted signal of the code-maker. By choosing to put AFRICOM bandwidth over state-controlled Chinese satellites in 2012, the U.S. Defense Department decided to extend their PRC opponents exponentially more “rounds” to win the game. The U.S> has won a tactical convenience at the cost of strategic peril. Defense Department representatives claim the use of the satellites was secure due to the encrypted nature of the transmissions. 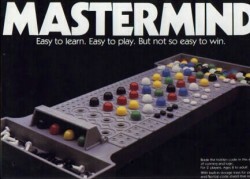 However, as in Mastermind, more exposure reveals more information, with which the code-maker can be beaten. With an unrestricted treasure-trove of data, the cyber-battle proven Dirty Data Dozen of Chinese cyber-warfare will have plenty of material to compare and contrast until base patterns are found and exploited. This vulnerability is especially worrisome in an area of responsibility rife with corruption issues and general penetration by state-associated Chinese assets. That access to the satellite transmissions might be doubly useful because of the potential access to the pre-transmitted data, further easing decryption efforts. This undermines force-wide communications, providing information that will end up not only in the hands of the Chinese, but the actors with whom their intelligence services cooperate. 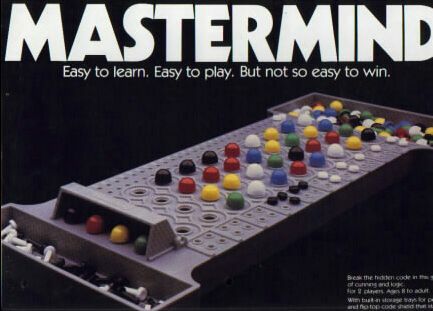 The U.S. stands not only to lose one game of Mastermind, but most of the tourney. You must accept that you won’t always have attractive alternatives. The Big Picture may demand tactical sacrifice. It was only last month that the CNO, ADM Greenert, said that the cyber-EM environment is “so critical to our national interests, that we must treat it on par with our traditional domains of land, sea, air, and space…” The EM-cyber spectrum may be invisible, but they have the same space constraints as those traditional domains. During the Cold War, if the berths at Bremerton were full, the U.S. Navy would never have requested berthing space in Vladivostok; if the U.S. Army found itself under-equipped, they would never request use of radio towers in East Germany to communicate with West German patrols. Resources are limited and must be rationed; put simply by Raymond Pritchett, “If this wasn’t the point to tell someone ‘no’ when they ‘needed’ bandwidth, what point is?” Refusing to prioritize the strategic long-term viability of U.S. communications security over temporary tactical comfort is the laxity alluded to by the CNO when he highlighted the need for a new attitude. We can start with the lessons learned from a 1970’s board game.